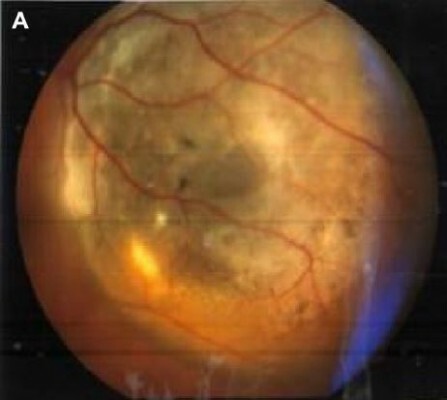 Objective: To investigate the homogeneity and vascularity of choroidal melanoma through magnetic resonance imaging (MRI) and brightness modulation (B-mode) ultrasound scan and their correlation with dimensions of tumor, as well as to measure the sensitivity of both modalities in retinal detachment (RD) detection. Materials and methods: This retrospective chart review included patients diagnosed with choroidal melanoma. All these patients underwent MRI scans using T2-weighted (T2-WI) and T1-weighted (T1-WI) sequences, before and after an intravenous injection of paramagnetic contrast material. The patients were also examined using a B-mode ultrasound scan, and the results from both modalities were compared (tumor homogeneity, tumor height, tumor base diameter, and tumor vascularity). Results: Forty-two patients (mean age =65.33±12.51 years) with choroidal melanoma were included in the study. Homogeneity was confirmed in 16 patients through ultrasound scan, in 19 patients through T1-WI sequence, in 21 patients through T2-WI sequence, and in 25 patients through T1-WI sequence + contrast (gadolinium). Patients with homogenous tumors presented with lower (P=0.0045) mean height than that of those with nonhomogenous tumors, whereas no statistically significant difference was found for base diameter measurements (P=0.056). Patients with tumors of high vascularity presented with greater mean height (P=0.000638) and greater mean base diameter compared with those with tumors of low vascularity (P=0.019543). RD was detected in 26 patients through T1-WI sequence, in 13 patients through T2-WI sequence, in 26 patients through T1-WI sequence + contrast, and in 32 patients through ultrasound scan, which proved to be the most sensitive modality. Conclusion: The height of choroidal melanoma was positively correlated with tumor’s homogeneity. Melanomas of greater height were found to be less homogenous, due to increased degeneration and higher occurrence of intratumoral hemorrhage. In addition, choroidal melanoma’s height was also positively correlated with the level of its vascularity. Finally, ultrasound scan was found to be more sensitive than MRI in the detection of RD.